BEST RAINBOW 10lbs 8oz Sam Latham from St Helens, 10lbs & 9lbs Paul Speed, 10lbs for Andrew Overend. Sport: The fishing over the Christmas period remained good but it was a little trickier than we have been used to. There were however some great fish caught and quite a few anglers managed three of the four types of types of trout in the Bank House McNab. Ian Stanworth nearly caught the McNab for a second time but just couldn’t find the tiger trout. Ian Caught blues browns and rainbows to 3lbs 12oz on egg flies fished under the bung. Paul Speed had a great day; he landed four trout that tipped the scales to 16lbs 8oz he then went on to return several more including a 9lb rainbow and 10lb rainbow. (See pictures below). Paul caught all his fish on cats whiskers fished back with a medium retrieve. The cat’s whisker is such a good lure. Personally I like the unweighted Cats. You just cast them out, give one quick strip just to tighten everything up and then fish the drop with a slow figure of eight. The takes have been like buzzer takes; your line just snaps tight, it’s great! If nothing does take on the first drop a couple of quick strips will lift the fly in the water and then you can repeat the process….try it works. Over the last few days the sport has picked up. Today Brian Hitchen took 9 trout to 8lbs on beaded buzzers and mini cats whiskers. He too just needed a tiger to complete the McNab and his catch included an 8lb rainbow and a 4lb blue trout. The lake has fished well right round but if I had to pick a few spots I would say, The lodge Pool, Witches Island, The Swim and The Mill Pool. Tight lines. Ben & Charlotte. Ps The trout in the farm have grown phenomenally so far this winter; they are way ahead of schedule. I could have stocked Stocks at the beginning of December as the trout were already averaging a Kilo! This year is going to be spectacular not only is the average stamp of the trout in Stocks going to be really good, somewhere between 2lbs 8oz and 3lbs, but the specimens are also looking fantastic. The best for years! Loads of doubles including some huge blues……roll on the February 25th! 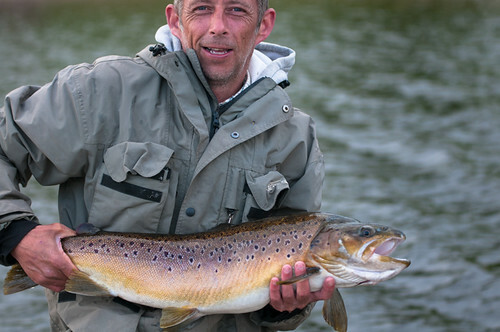 This entry was posted in Bank House Fishing Reports on January 11, 2012 by Ben Dobson.